Heavy duty kingpinless casters featuring unique hot forged ASTM1045 steel design eliminating problems associated with kingpin failure due to severe shock loading. Top plate and inner raceway are built with an integrally forged construction. Sealed raceway is machined and induction hardened providing exceptionally smooth performance. This zinc plated kingpinless caster model combats thrust and load in severe enviroments by integrating 1/2" diameter HRC 45 steel ball bearings. Raceway includes notches for 4 position lock, and grease fitting for maintenance. Applications: Wherever severe shock is anticipated. 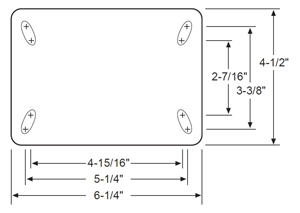 Top plate for kingpinless casters designed to handle multiple bolt patterns. Select kingpinless caster wheels have options for wheel bearings. Choose from Tapered, Roller, and Delrin to optimize your application.